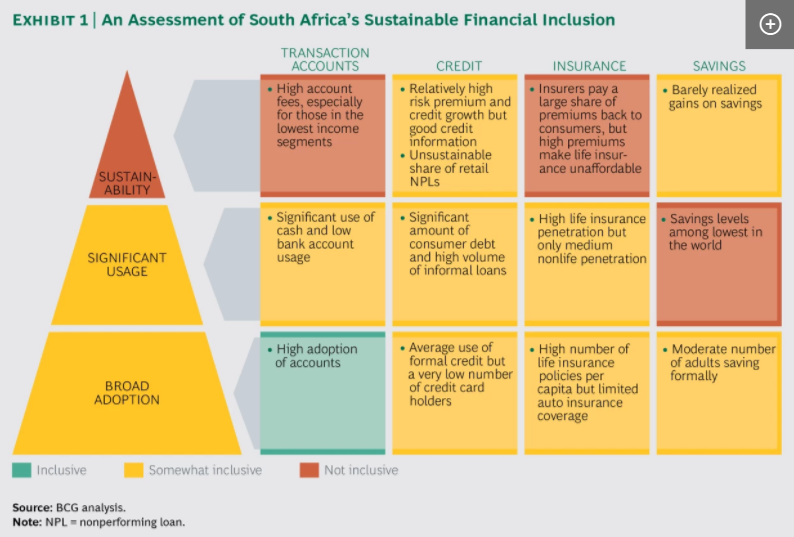 In this report published last April 2017, the consulting firm BCG identified the root causes of financial exclusion in South Africa and suggested a path to higher inclusion. 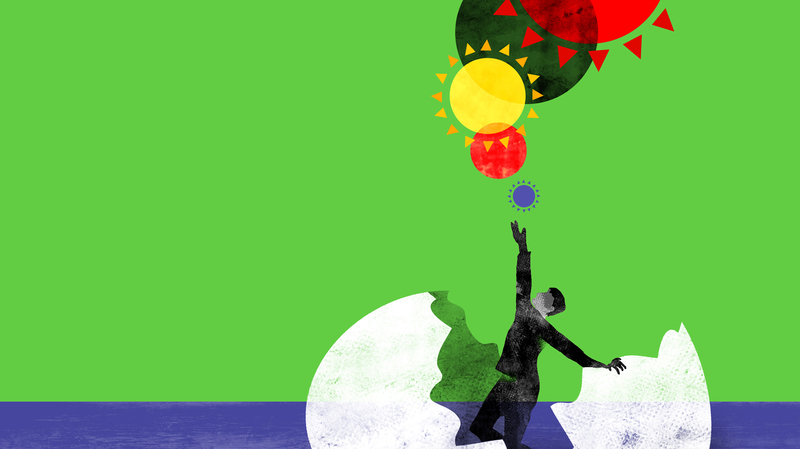 In BCG’s most recent Sustainable Economic Development Assessment (SEDA), the country scored relatively poorly—ranking 149th of 162 countries—in its ability to convert wealth into well-being. 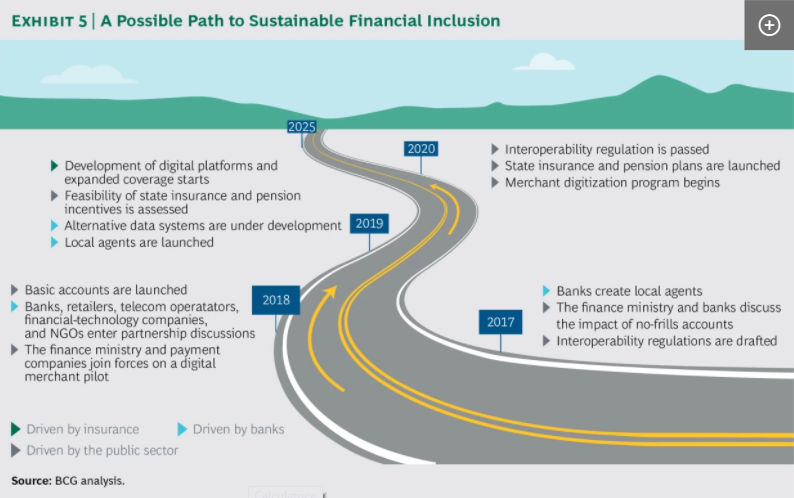 More than 70% of South African adults have a transaction account which is higher than other emerging markets such as in Brazil, Chile, India, Mexico, and Russia. Many of South Africans withdraw their entire paycheck or welfare or other public, or social, payment almost as soon as they receive it, and only 24% make more than 3 monthly transactions of any kind—such as withdrawals, transfers, or card swipes—through their account. About 60% of all transactions made by South Africans are conducted in cash. At 12%, South Africa is a much more active borrower than Nigeria (5%) or India (6%), but it’s below Kenya (15%) and Germany (19%). The share of adults with a credit card, 13% in South Africa, is relatively low, compared with many other emerging markets, such as Brazil (32%), Russia (21%), and Mexico (18%). Defaults on unsecured personal loans are in the red zone at 12%—far higher than in risk-averse nations such as Germany (2%) and China (1%). According to the FinScope survey of consumers, only 12% of the population is covered by full life policies that provide long-term benefits for survivors. Nearly 50% of households earn less than R3,800, about $270, a month. Transaction accounts are too expensive: 40% of consumers without an account say fees are too high or bank branches are too far away. Life insurance adoption rate in South Africa is higher than that of far wealthier countries such as Italy and Spain. South Africa’s relatively high adoption of transaction accounts masks the reality: the country remains a cash-oriented society. Credit in SA is more often aimed at consumption and immediate gratification than at starting a business or getting an education. Just wish to say your article is simply excellent.